This is a car that has been on the site in our Feature Car section for almost a year now but we just added some updated photos and information. 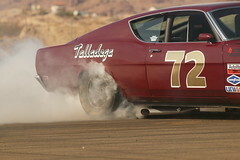 This is one of the nicest and wildest 1969 Ford Talladega cars you will ever find. I won’t repeat the story you can visit our page on the car, Click Here for all that. Rick provided us with some new action photos as well as some dyno sheets on the engine. 725 rear wheel HP get your attention?